Sole Nero lists citrus (grapefruit, orange, lemon & lime) with sandalwood, spices and musk. Which doesn’t nearly say enough. The spices are there right with the citrus and a hint of comb-like honey. It’s meant to evoke a trip to Sicily, and if this is remotely what that place smells like, then bye-bye Beverly Hills, sto cercando una casa Siciliana presto. If the spices and sweetness elevate the citrus to the heavens then the musk and the sandalwood ground it with a surprising and wholly delightful but of dirtiness. I’m in thrall..
Noche Del Fuego was by far my favorite. The first hit is of bergamot and rich. lovely patchouli. Black pepper and sandalwood join in as well as (unmentioned, but I’m smelling) smoky spices and a hint of leather. It reminds me a bit in a way of ELdO’s Rien, a scent that I really like but never actually bought more than a decant of. Rien is all swagger and attitude while Noche doesn’t have anything to prove. I admit that I’ve been in sort of the perfume dumps lately; I’ve been sniffing a lot lately and a lot of it made me think I was losing interest. Noche gave me that weak-in-the-knees can’t-stop-smelling feeling I hadn’t had in a while..
Spadaro is available at select Nordstrom’s and at spadaro.co Sole Nero and Doux Amour are $135 and Noche Del Fuego are $155; all are 3.3 oz. I asked for and received my samples from the perfumer. Hi, Tom! What a luscious, mouth-watering post. I’d not heard of this line before, so thanks for putting in on the radar. Just wished I lived close enough to sample these, as they all sound wonderful. I must confess I’m a little envious of your scent-centric location out there in L.A.; I live near a major metropolitan area but except for Neiman’s, Saks and Nordstrom, it’s verging on a perfume wasteland (no outlet for Malles, Lutens, L’Artisan, Byredo, etc.). OK, I’ll quit whining now. Have a great day, everyone! Well, you can order a sample set pretty cheap.. I should come out there and BEAT you! Tom…..all three of these sound phenomenal!! Especially Sole Nero. And the Morocco one….’jasmine liks sheer silk’…that’s just so beautifully evocative… I really thought I was past lemming……but noooo! If there’s Roscoe’s after then bring it! All three sound interesting and different – quite a feat lately in the perfume world. 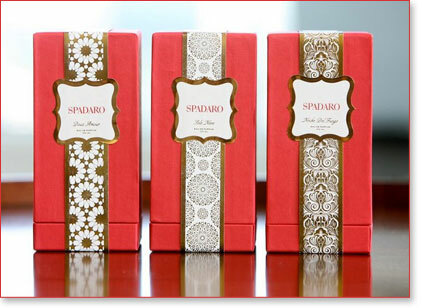 Hey, at the Sodaro site you can get a sample pack with all three for $10, free shipping (I know because after reading this post I rushed off and ordered it). Not that you shouldn’t come to L.A. regardless. Exactly — you can’t mail-order Roscoe’s! And unfortunately, I went to complete my sample purchase and the site wants to charge me $9.40 in shipping. For six milliliters of perfume. I don’t think so. Ow indeed! But she’s a small perfumer and has to pay the freight.. Stinks..
As a small biz meself, I feel her pain – it is difficult to reconcile it on both sides, though – her costs v. our perceptions. As a customer I find it psychologically nearly impossible to pay as much for shipping as I do for the purchase, even when I know it’s the going rate! That’s the beauty part of perfume. It’s not me because it’s sheer and feminine. I’m neither Maybe I wrote it badly? Wow, a weak in the knees new scent at Nordstroms – got to check it out. I know Ann is right that it’s enviable, but it must also be kind of exhausting to live in LA and have so many smellies to cover. Thank you, Tom! It can be, but when you find something really nice it’s so great! Ooh..I need to smell noche del fungo as I really liked Rien..